"NO MATTER WHERE YOU GO,,, THERE WE ARE"
Tattoos Are Like Stories ~ They're Symbolic Of The Important Moments In Your Life. For Someone Who Likes Tattoos, The Most Precious Thing Is Bare Skin For That Next One! DO YOU HAVE A BAD TATTOO YOU WANT GONE ??? 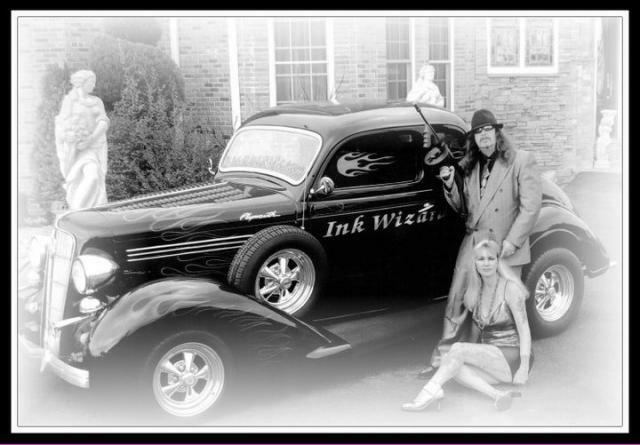 COME TO INK WIZARD TATTOOS ~ WE'LL BE SURE IT'S GONE FOR GOOD! Ink Wizard Tattoos Performs a unique way for tattoo removal without all the expensive cost involved if done with laser. Ink Wizard Tattoos will ink your old tattoo to remove it and you will notice, much of nothing. Imagine as if you had an bumper sticker that you peeled off. The residue left behide, is basically what you will see with our method at Ink Wizard Tattoos. You will hardly notice, anything was ever there in the first place. For one who is spectical or not sure about tattoo removal, we specialize in tattoo cover up. We can make a bad tattoo look like a masterpiece, just come on in to talk to our artist about your transformation. Check out our Ink Wizard Tattoos Tattoo Cover Up Gallery for photos of recent cover up work by artist of 33 years Gary Hall.